PLEASE NOTE: There has been a change to the continuing education credit information since the brochure was printed. Please review the updated CE information under the “CE Credits” tab prior to registering. OREGON COUNSELORS: This intermediate activity consists of 6.25 clock hours of continuing education instruction. Credit requirements and approvals vary per state board regulations. Please contact your licensing board to determine if they accept programs or providers approved by other national or state licensing boards. A certificate of attendance will be awarded at the end of the program to participants who are in full attendance and who complete the program evaluation. This program is approved by the National Association of Social Workers (Approval #886759332-9696) for 6.0 continuing education contact hours in Social Work. 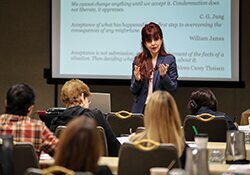 WASHINGTON SOCIAL WORKERS/COUNSELORS/MARRIAGE & FAMILY THERAPISTS: This training has been approved for 6.25 CE’s for Washington Licensed Mental Health Counselors, Licensed Marriage and Family Therapists and Licensed Clinical Social Workers. WMHCA Provider #1504.